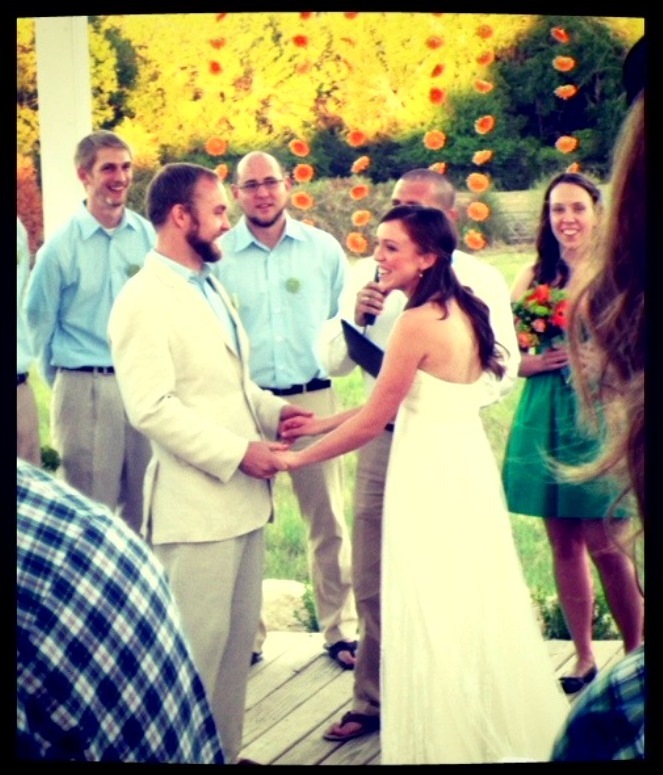 Our last wedding until next year took place this past weekend. It was a real communal affair with everyone pitching in with setup, cleanup, food, drinks, and lots of love. Miah and Christie were so smiley the entire evening. The wedding took place during the annual HarFest at a friend’s ranch out in McDade, TX. Entertainment included bands jamming out, C-Man DJing, a bouncy house for the kids, and open mic toasts, incited by C-Man of course. People really brought their A-game with the potluck food. Our friend, Carly, even made the amazing wedding carrot cake. 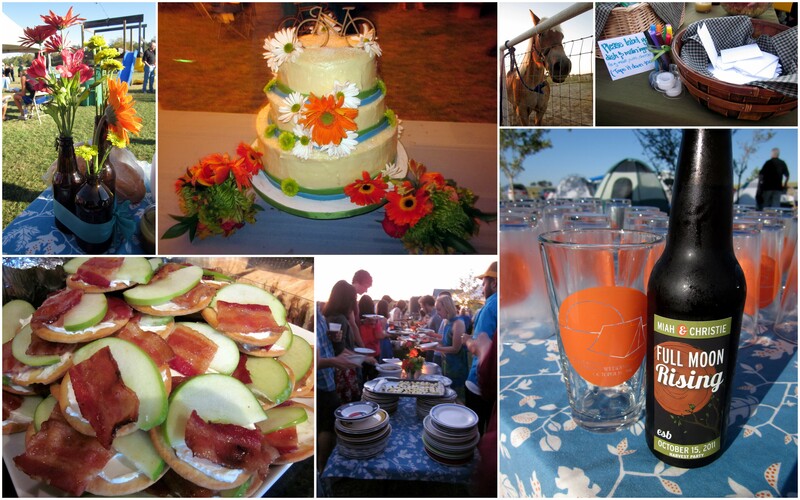 There were kegs of beer, boxed wine, and home-brewed beer, mead, and cider. We camped out after the reception. For my contribution, I led the making of the bridal party bouquets (a couple are pictured with the cake above, it took about two hours for four people to arrange six bouquets), made Spicy Candied Bacon and Apple Canapes again since I knew they would keep well and were a hit at the Ladies Brunch, and assembled smores pops. I originally wanted to make these Wedding Marshmallow Pops served with graham crackers, but the mini-cake look wasn’t so pretty with dark chocolate. Microwave a cup of the chocolate (or however much you feel comfortable working with at a time) in a microwave-safe bowl following the manufacturer’s directions. Be careful not to burn the chocolate. Dip the end of a lollipop stick in the melted chocolate and poke through a marshmallow. This helps keep the marshmallow on the stick. I found it was easier to prep 15-20 of the marshmallows on the stick before dipping them to minimize the number of times I had to reheat the chocolate. Dip the entire marshmallow in the melted chocolate, then roll it in the graham cracker crumbles. I think it looks prettier to only half dip the marshmallow in chocolate, but I wanted more chocolate and graham cracker flavor in my pops. Optional: dip the bottom of a heart sprinkle in the melted chocolate and place on top of the marshmallow pop. This was purely for the wedding cuteness factor. Set the smore pop in foam or a display box to harden. Optional: place the smore pop in a clear treat bag and tie with a ribbon bow. The smores pops looked better than they tasted in the display, but people seemed to enjoy them anyways. Marshmallow pops are much easier to put together than some other pops, but in making 72 of them, it took about six hours. Consider yourself warned. 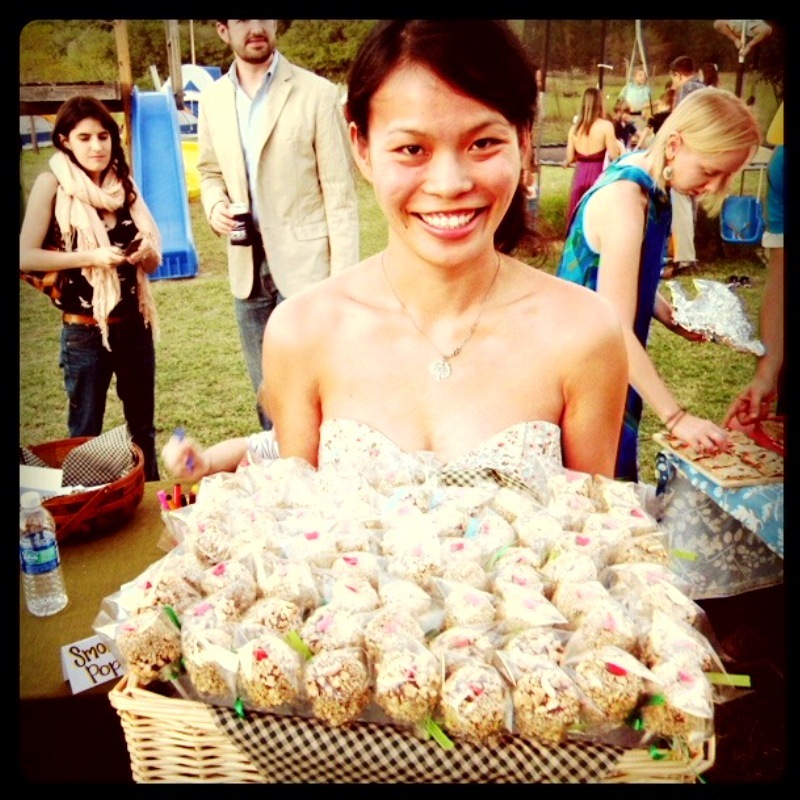 This entry was posted in Food, Weddings and tagged Marshmallow pops, potluck wedding. Bookmark the permalink. love love love the idea of the s’mores pops! Great job. 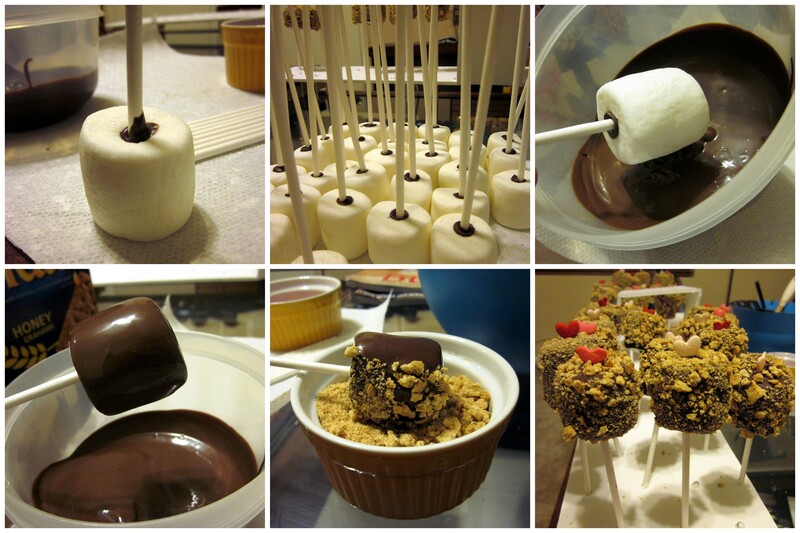 The s’mores pops tasted amazing, so you must be saying they looked SUPER amazing! Seriously, I could have eaten those all night. Huge s’mores fan here. Celeste and I are photobombing in that last photo 🙂 Linda, the canapes and smores were fantastic! you are so awesome! the smores pops are so pretty. Hey! This is Mrs. Mouse from Weddingbee. I totally had one of your s’mores pops, and it was amazing! I took it home from the wedding and ate it later because I was so stuffed, and I was really sad that I only had one!